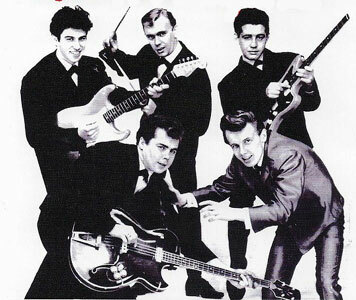 Groupe Rock 'n' Roll Anglais formé en 1959. Johnny Taylor & les Strangers ont surtout fait une carrière en France de 1962 à fin 1963 avant de rejoindre les accompagnateurs de Vince Taylor et de Johnny Hallyday en 64/65. Le groupe était composé de Johnny Taylor, Tommy Lorne, Stu Garbett, Ralph Douthwaite et Mike Smith. English Rock 'n' Roll group formed in 1959. 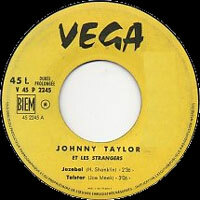 Johnny Taylor & the Strangers mainly made a career in France from 1962 to the end of 1963 before joining the accompanists of Vince Taylor and Johnny Hallyday in 64/65. The group consisted of Johnny Taylor, Tommy Lorne, Stu Garbett, Ralph Douthwaite and Mike Smith. Talents : Johnny Taylor : Vocals, Guitar - Tommy Lorne : Drums - Stu Garbett : Lead Guitar - Ralph Douthwaite : Rhythm Guitar - Mike Smith : Bass. 2005 CD MAGIC 3930 534 (F) COMPLETE 60'S INSTRUMENTAL - Les STRANGERS - Telstar / I’m Goin’ Home / Perfidia / My Girl Josephine / L’idole Des Jeunes « Teenage Idol » / Sherry / Tous Les Garçons Et Les Filles / Sheila / BONUS TRACKS : Jezebel / File, File, File « My Little Girl ».